Congratulations to the three recipients of the AIA Commbank Scholarship for 2016 -17. The Australia Indonesia Association of NSW (AIA) is offering 2 scholarships to NSW high school students for an intensive 2-week Indonesian language course. The course includes daily tuition and real life tasks to practice what has been taught. It is held in Yogyakarta, Central Java. NSW Student in Yr 10 or 11 who is studying Beginners, Continuers or Extension Indonesian. Engaged with the wider school and community on a range of activities. Jan 2-13, 2017 2 week immersion program (you will need to arrive in Yogyakarta before January 2, 2017). The Australia Indonesia Association Commonwealth Bank Scholarship for High School students is an intense 2-week, expense paid immersion program in Jogjakarta, Indonesia. The course will run from 4-15th January 2016. We appreciate the support of our major sponsor – the Commonwealth Bank. The Course takes place in Jogjakarta, Central Java, Indonesia. The students will stay in a homestay with an Indonesian family, they will attend Indonesian school each day and have supervised missions into town to practice what they have learnt. The students will develop life skills, a deeper understanding of our nearest neighbour and have the experience of a lifetime. It is an intensive course. The course is delivered by the Australian Indonesian Association of Victoria (AIAV) and was designed by Mr Tata Survi, an Indonesian Australian who leads Indonesian language study at various schools in Australia. AIAV has been running successful Indonesian immersion courses in Yogyakarta since 2007. NSW High school students in Y 10 or Y 11 (Beginners and Continuers) who are studying Bahasa Indonesia. Students from all schools are welcome to apply – Public, Independent and Catholic. This year two students will be selected. · Demonstrable ability in Bahasa Indonesia and have the intention to continue Bahasa Indonesia studies. · Engaged with the wider school or community in a range of activities. · The potential to be a cultural ambassador. · Student to keep a diary and be prepared to report back on the experience. · Will keep a diary or blog to share the experience and promote the study of Bahasa Indonesia after returning. · Provide a letter of support from the school’s Indonesian language teacher and a sign off by the school principal on application. It includes a return flight Sydney-Yogyakarta, assistance to travel to Sydney if required, homestay with an Indonesian family, 2-week language course and meals. Passport, travel insurance and visa are excluded. Aug-Sept: Shortlisted candidates will be interviewed. Congratulations to Year 10 Merewether High School student, Carson McGovern, who is one of two successful NSW applicants for the Australia Indonesia Association of NSW’s CommBank Indonesia Scholarship. Sydney, 19 November 2014 – This week the Australia Indonesia Association NSW (AIA NSW) announced the winners of its Indonesian scholarships for high school students. The AIA offers scholarships to support and encourage students who are committed to the study of Bahasa Indonesia. “This year only 190 NSW students sat Indonesian for their HSC. While this number is small it is up 10% on last year and we want to encourage this upwards trend with our scholarships,” says Mr Eric de Haas, President AIA NSW. Caitlin O’Brien, Yr 11 (2014) Indonesian Beginners Student, Tumut High School. 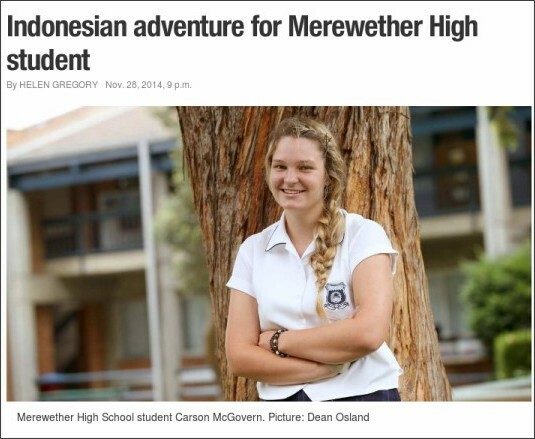 Carson McGovern, Yr 10 (2014) Indonesian Continuers, Merewether High School. Kiara Thomson, Yr 12 (2014) Indonesian Continuers, Woolooware High School – planning to study at Sydney University. “We can’t understand why there aren’t more students studying Bahasa Indonesia,” says Miriam Tulevski, Education Convenor, AIA NSW. “Our winners can see this opportunity. Bahasa Indonesia in a student’s toolkit will give them a competitive edge in the Asian Century and we congratulate our winners,” concludes Ms Tulevski. “Education has been part of Commonwealth Bank’s strong commitment throughout the years. We employ almost 3,000 people in Indonesia and we are very supportive of this great initiative to improve understanding and engagement between Australians and Indonesians,” says Mr Ian Whitehead, Executive General Manager, Indonesia, Commonwealth Bank. The AIA CommBank Scholarship is an expenses paid 2 week immersion course in Yogyakarta. Students will stay in a home stay with an Indonesian family. It is delivered by the Australian Indonesian Association of Victoria and will take place in January 2015. Last year the award was won by Maire Playford who became School Captain at Macarthur Anglican School. Named after our enthusiastic patron who passed away in 2013, the “Lottie Maramis” Scholarship is a $500 cash prize for a year 12 student continuing with the study of Bahasa Indonesia at University. The Australia Indonesia Association of NSW is a not-for-profit, non-government organisation established in 1945 to encourage cultural exchange and to promote friendship and understanding between Australians and Indonesians. Activities include education initiatives, talks, tours, dinners, fundraising and an annual AIA Awards night celebrating contributions of Australians to the relationship with Indonesia. 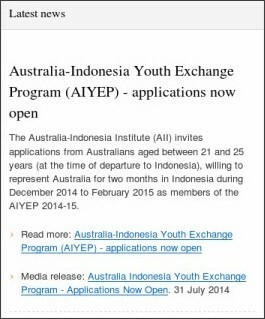 A fantasic opportunity for young Australians and Indonesians aged between 21-25 years. For more information click on the links below.